Bangkok is one of the great cities of the world and is the most visited city of the world with over twenty million people popping in to enjoy its charms each year. Perhaps the huge variety of attractions is what makes Bangkok great: in one night (and one day) you can cram a lot in. 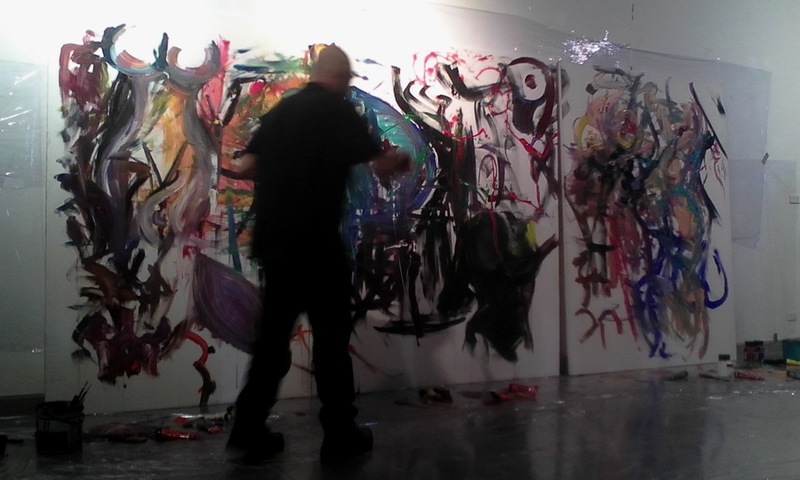 Last weekend I visited several sites with exhibitions from the Bangkok Art Biennale, saw great productions of the rock musical Jesus Christ Superstar and William Golding’s play Lord of the Flies, and topped it of with visits to several art galleries participating in the annual Galleries’ Nights. 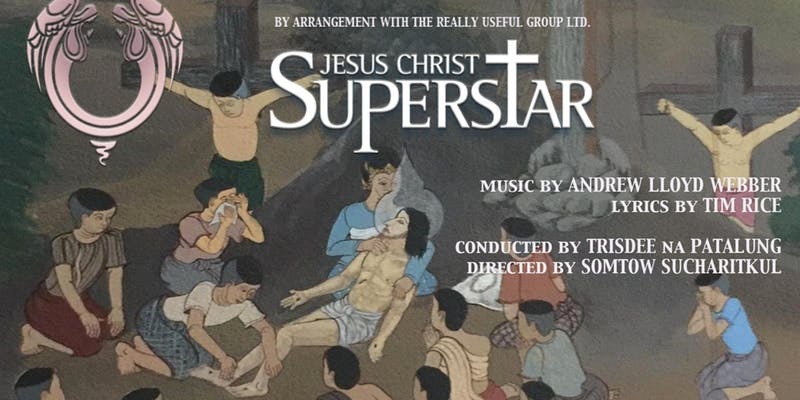 Jesus Christ Superstar is a 1970s rock opera by Andrew Lloyd Webber and Tim Rice. I think it was the first opera of its kind and has now been performed many times worldwide. It originally caused heated debate over its religious and political themes but despite this it is a show with great musical numbers and a powerful punch. Watching it in the Thailand Cultural Centre where most patrons were Thai Buddhists made me think again about the Christian story that is woven into the musical. The barbarity of the Romans and the Jews is shown brutally and uncomfortably, and would no doubt be compared unfavourably to the pacifism preached by the Lord Buddha. I wonder what the Buddhist audience made of the savagery depicted in the show. Christians have often condemned this rock opera because Judas Iscariot is shown to be an innocent “puppet” who accuses God of murdering him – rather than the more commonly accepted view of him as a simple money-hungry traitor. In the Bangkok production conducted by the brilliant young conductor Trisdee na Patalung, Judas was played by the ironically named Pure Ekkapan Wannasut. Pure was a winner on Thailand’s Voice programme and has been awarded scholarships for further studies. 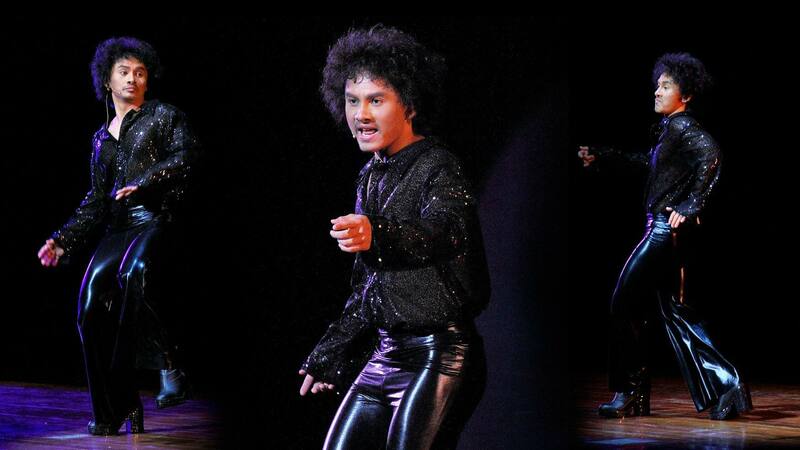 His rock background was evident in his on-stage moves and his powerful voice. Pop Chaiporn as Jesus and popular Bangkok jazz musician Athalie de Konning as Mary were supported by “the most famous foreigner in Bangkok” – Australian Andrew Biggs as Herod. Biggs has about 1.8 million followers on Facebook and started as an English teacher in Thailand many years ago. 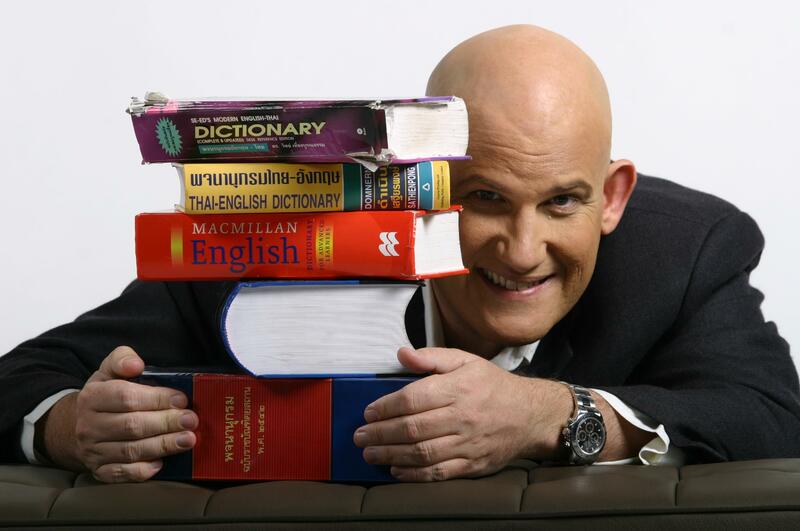 He owns a language school and is a regular columnist for the Sunday Bangkok Post. He has been awarded several prizes including the Thai Government’s Ministry of Culture Excellent User of the Thai Language award – the first time the award had been given to a foreigner. In this Webber Rice musical, Herod is a comic role (see Josh Mostel in the role in the 1973 film at youtube.com/watch?v=R8lzmbAn8_Y). Tall, bald Biggs was a natural selection for the Bangkok production, even adding a topical line or two in the fashion of Gilbert and Sullivan’s very modern Major General. The Bangkok Art Biennale (BAB), the first international contemporary art festival of its kind to be presented in Thailand, ran from October 2018 until last Sunday. The BAB featured works by seventy-five artists from all over the world with exhibitions held in major shopping malls, derelict Colonial riverside buildings, art galleries, street corners and temple courtyards. I visited several BAB sites on a previous visit to Bangkok, and several more this time including the Bangkok Art and Culture Centre (BACC) near the popular MBK shopping mall. Want something electronic at a good price? The BACC is a modern building with nine or ten floors of galleries and exhibition spaces. A striking feature is the sloping walkway “gallery” that curves around several floors on the interior, leading up to the ninth floor where a special photographic exhibition is currently presented. 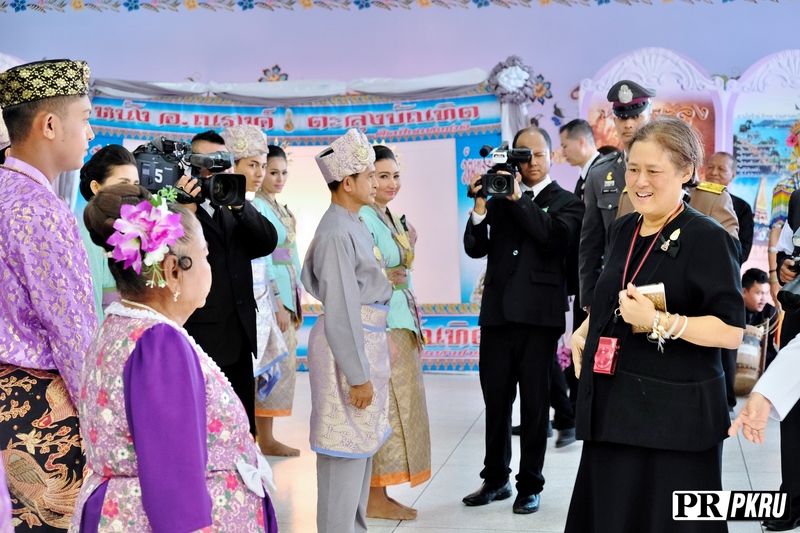 Thailand’s favourite member of the Royal Family is possibly the sixty-four year old Princess Maha Chakri Sirindhorn. Like her late father King Bhumibol Adulyadej (Rama IX), she is a tireless worker for the people of the Kingdom and is a keen photographer. She is almost never seen without a camera strung around her neck. She is also a keen traveller on official or personal tours. A massive exhibition of her photography in China, Georgia, Armenia, Ireland, Wales and Thailand is presented appropriately on the ninth floor of the BACC. Princess Sirindhorn’s subject matter ranges from flowers and domestic animals and insects in the gardens of her home to landscapes and portraits. The exhibition has several impressive huge blow-ups but some of the other works have been enlarged too much and they are rather fuzzy. However, her eye for a well-composed image is never in doubt and there are many striking images as mementos from her travels. 2019 in the Chinese zodiac is the Year of the Pig. It is fitting, then, that this year I have seen two staged versions of William Golding’s 1954 novel Lord of the Flies with its central themes of savagery and the decline of civilised behaviour in a group of school boys apparently stranded on an island as the result of some unknown war. The brutal slaying of a pig, whose head is then set up as a totem, and whose blood is ceremonially spread on the boys’ faces and bodies, is a powerful moment in the play. 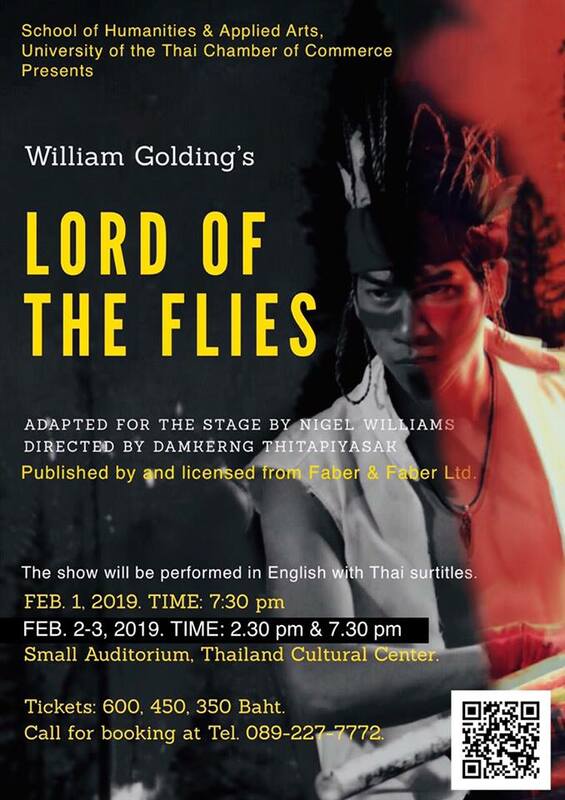 The University of the Thai Chamber of Commerce presented Lord of the Flies at the small auditorium of the Thailand Cultural Centre in February on the same weekend as the Superstar production. This full-length version (almost three hours including one intermission) was directed by Damkerng Thitapiyasak, the Head of the Department of Performing Arts at UTCC, and featured performers from that university and several other Bangkok universities. The play was presented in English with Thai surtitles, and as far as I could estimate, I was the only non-Thai in the audience. The Thai surtitles were largely indecipherable scribbles for me (I could only pick up a word here and there) and I guess the spoken English was for many of the audience a similar mystery. Ralph, Jack and Piggy are the lead characters and in this production Piggy (Kritanu Manokam) stood out with excellent diction and fine acting. The blooding of the pig was well handled, but as fire is also a key element of the story, the almost total lack of anything “firey” was disappointing. Great lighting effects and a simple but effective staging added to the experience. … so how many galleries have YOU been to? After Flies, it was time for a quick trip back to my hotel to wash off the metaphorical blood and the squashed insects and to do the almost impossible: Jack and Piggy and Co could not find their way off their island … and I had similar fun and games finding the galleries I had selected to visit as part of Galleries’ Night. The event maps and my telephone’s Google maps conspired to get me turning RIGHT when I should have turned LEFT but I finally found Gallery 23 with two exhibitions in the heart of Srinakharinwirot University. 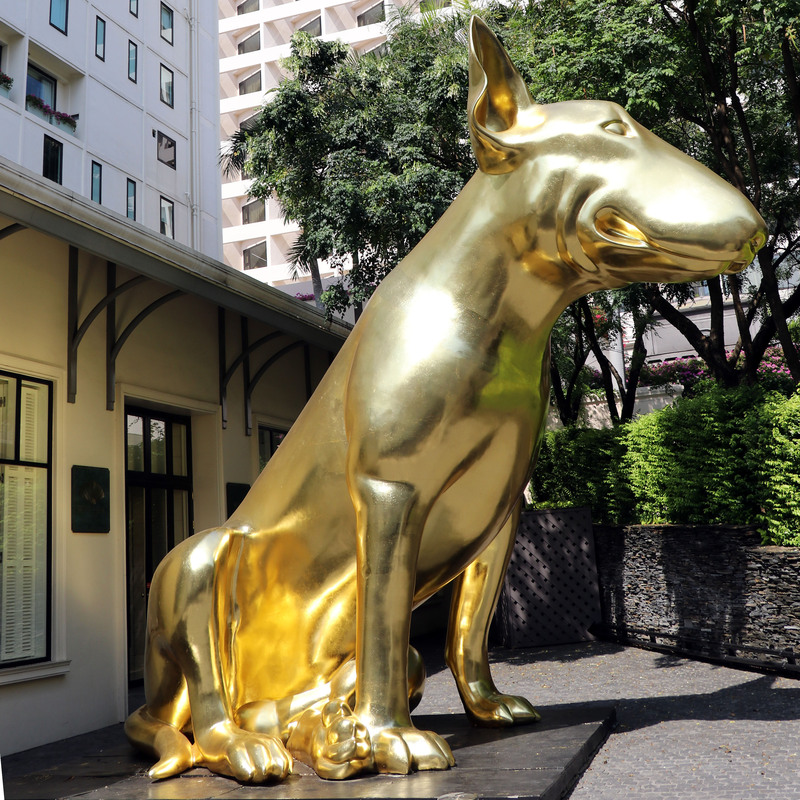 The gallery takes its name from Sukhumvit Street 23, which at its northern end is an open, green and leafy area, but further south, where it is joined by the infamous “Soi Cowboy”, it is not so pleasant as the red-light bars and massage parlours of Soi Cowboy spill into Sukhumvit 23. Hello! You want massage …? Despite a long and sweaty trudge to Gallery 23, I did not find either of its two exhibitions terribly exciting and was preparing for a long hike back to the Skytrain station when one of the event volunteers grabbed my arm and directed me to a complimentary tuk tuk to take me to another gallery. SAC had two solo exhibition on two floors – some beautiful works by Korean artist Gi-ok Jeon (see featured photo LEFT) although her painted stones did not ring too many bells for me, and some marvellously coloured and textured works by Akira Ishiguro. 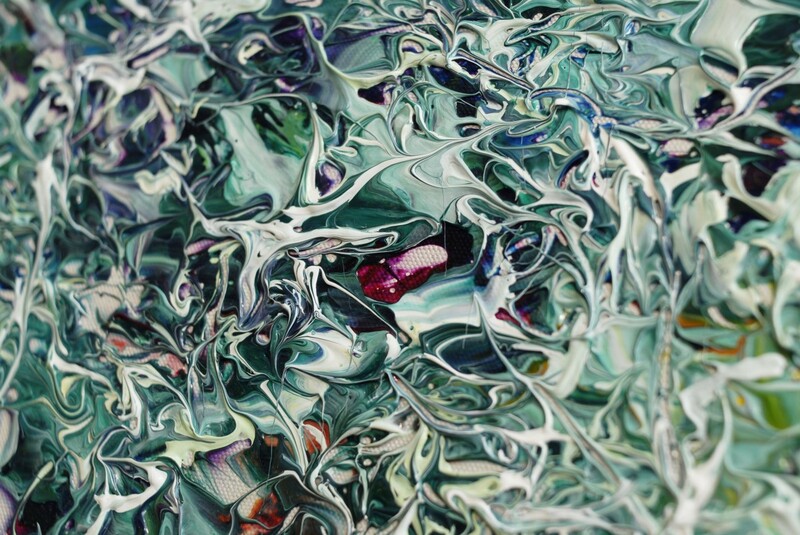 The title of the Japanese artist’s show was Critical Reflection through Marblesque Painting and he used generous dollops of brilliant paints swooped and swirled together to create – well – almost marble-like effects. His works were of several sizes, ranging from two plinth-mounted pieces just fifteen or twenty centimetres square, to huge wall-sized pieces. For me, the most effective and attractive were those about a metre square. Off (via tuk tuk and long walk and BTS Skytrain ride and long walk) to the Nova Contemporary Gallery where three small odd shapes were scattered on the floor and several inscrutable things behind a glass wall failed to fire me with enthusiasm. Their finger sandwiches were, however, quite tasty. Oh, just five or six. And you? Sweaty, footsore, weary and just about ready for bed, I was glad to board a subway train back to my hotel. The subway is almost always rather crowded – not quite so Rubik’s Cube dense as Tokyo’s trains, but still pretty friendly crowding. One seat in each carriage is nominally reserved for pregnant women, old age pensioners and monks. On one train there was a middle-aged monk, wrapped in his saffron robes and seated in the special seat, but quite fenced in by women. A monk may not touch a woman and no woman may touch a monk. If a woman wants to hand something to a monk she must place it on a table near him or on a special platter thing to ensure there is no physical contact. The monk wanted to get off the train. What to do? He turned and tapped a young man standing beside him and pointed wordlessly to the women trapping him. The boy tapped one of the women who spun around. The boy pointed at the seated saffron sage. The woman leaped away almost in terror of the solecism she had almost committed. Other women nearby also became springboks clearing a way for the monk who serenely, with no pushing or shoving or even the need for an “Excuse me”, trotted off the train and into the night. The Huai Khwang station is in an area by the same name about half way along the Ratchadaphisek Road and is a busy residential and commercial centre with several large hotels, several large shopping malls and even more large houses of ill repute. Anyone for a soapy massage? 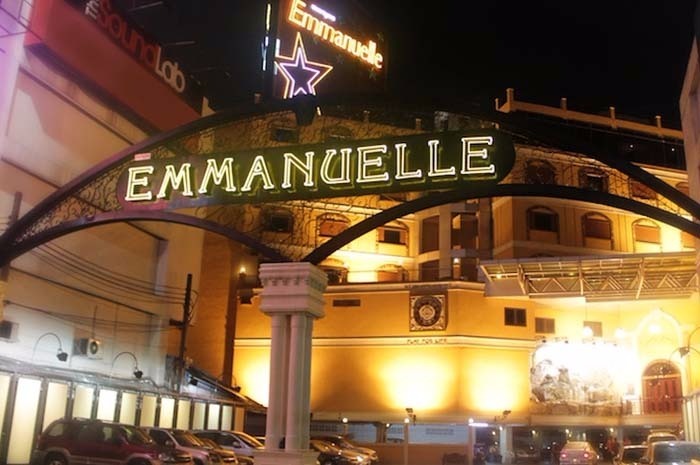 One, the Emmanuelle Massage and Entertainment Club, sprawls over several buildings and courtyards, while others were more modest in size. The Hiclass Entertainment establishment was quite a modest affair but its website says that “soapy” massages and other forms of … um … entertainment are on offer. Nearby is the Merci Body Massage place. I rather liked the fact that they included the word “body” in one of their signs. It would of course be terribly embarrassing if you were to go there hoping that someone could massage an old pair of riding boots to make them more supple only to find out that riding boots (and probably not even riding crops) were not the targets of the massages on offer. Just over the road, according to Google Maps, is the Alaina – quite certainly a house of ill repute. It was raided and the manager arrested in July 2016 for alleged human trafficking, but a subsequent posting reported that it was “a neat and quiet place”. Perhaps the absence of the poor souls who had been forced into working there has quietened the place down. Yes – the Kingdom’s capital city is crowded. Yes it is polluted – every second person was wearing a facemask to combat the serious air pollution – but it is not really a “stinking” town. I always enjoy my visits to the city, as there is always so much to see and do – even if I usually do spend more than one night in Bangkok. This entry was posted in Contemporary art, massage, Opera, Royal Family, Thailand, Train travel, Trains, Travel. Bookmark the permalink. Looks a good sort of weekend! Great read Chris. I would have loved it, pollution and all.